With ActX there is now a practical way to add precision medicine to your practice without impacting your work flow. Typically, today’s genetic testing involves ordering a specific test, waiting several weeks or months, and then receiving a long textual report. After that, you will likely need to look elsewhere for advice on how to proceed clinically and answer any patient questions. And you will need to stay up to date as our knowledge of genetics continues to advance. ActX radically improves the practical application of genomics in clinical practice by building real-time decision support -- based on genetics -- into the Electronic Health Record that you use every day. With a minimal investment in time, and no change in normal workflow, you can begin to practice precision medicine. GenoACT℠ analyzes the patient’s genetics and gives you actionable clinical decision support information within your normal Electronic Health Record workflow. Your prescriptions are checked in the background against the patient’s genetics as you order them, and you are alerted if there is a significant issue. And for serious actionable risks, you are alerted in your normal clinical inbox as they are detected. GenoACT℠ is dynamic and frequently updated to give you the most up to date information. We understand that physicians are busy and not necessarily experts in genetics. 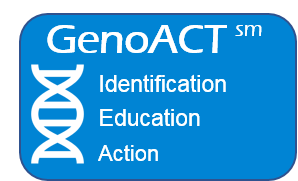 GenoACT℠ is evidence based and starts with a short concise summary, has an extended succinct explanation, and includes screening and treatment recommendations from leading authorities. It gives you the information you need to educate the patient and decide whether a referral is indicated and what clinical actions should be considered. The GenoACT℠ knowledgebase is built by a team of clinicians, geneticists, genetic counselors, and clinical pharmacists, continuously updated and informed by leading medical geneticists. Adding precision medicine to your practice gives you the ability to provide more personalized preventative screening and care decisions for your patients. ActX will alert you to actionable, evidence based, genetic risks for cancer, cardiac disease, metabolic disease and other conditions that often are not identifiable from family history and are asymptomatic. Around 3% of patients have such risks. ActX’s GenoACT℠ will provide you with a clinical summary, recommendations for screening and treatment from leading authorities, along the references. You will be able knowledgeably discuss the risk with your patients, refer if necessary, and develop a care plan. While Carriers do not usually have the disease, they carry a genetic variant that can be passed down to their offspring. Carrier status screening is of particular interest to patients of child-bearing age. Usually, the disease is recessive, meaning carriers who only have a single variant do not display symptoms of the disease. When two carriers have children together, there is a 25% chance that the child could inherit both disease-causing variants from their parents and develop the disease. Carrier Status is becoming increasingly important for family planning. Currently, medical genetic tests are usually ordered for individual medications, a limited group of medications, or for an individual risk for a high risk patient. Return of results often take weeks. The ActX Genomic screening test provides comprehensive coverage of medications where there is significant evidence of a genetic effect, serious actionable genetic risks, and carrier status. After ActX screening, with EHR integration, each new prescription receives genetic screening in seconds rather than weeks. With ActX, each patient is screened for hundreds of medications and dozens of risks as well as carrier status. After authorization, your patient receives an email that allows them to sign up for testing, be consented, and receive a home saliva kit. After collection of 1 cc of saliva at home and confirmation of their identity, the kit is dropped in the mail and sent to our CAP/CLIA certified laboratory, where it is genotyped. When the patient genomic profile is available you will be alerted inside your Electronic Health Record (EHR). If no EHR integration is present, alerts are by email. The patient will normally have access to their genomic profile in easy to understand patient language a week after the provider. Prescriptions written in the EHR will be automatically checked (in background) against the patient’s genetics for efficacy, adverse reactions, and dosing. Patient genetic data is frequently re-analyzed using the latest knowledge. If an important change in your patient’s genomic profile occurs, you will be notified. The patient will subsequently be notified as well. "ActX, and pharmacogenomics in general, are the beginnings of the establishment of a new standard of care in medicine prescription. In not so many years it will be thought ludicrous to prescribe an SSRI anti-depressant without a genomics panel; laughable that a provider would give a patient a medicine which had no hope of ever helping him or her-- then waiting for the one month follow up to declare this medicine a failure".